Any nail polish addict worth their salt has heard of the elusive Clarins 230 - aka Unicorn Pee (I genuinely love whoever came up with that nickname). 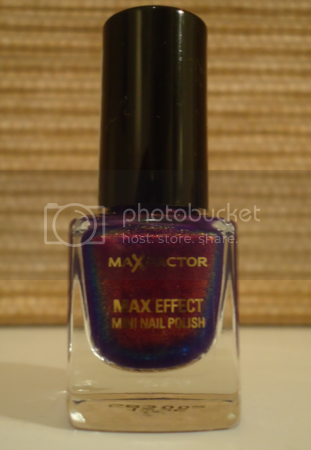 It's been discontinued for years and consequently has become probably the most coveted nail polish in the world. Bottles sell for ridiculous prices on eBay (I just had a look, and some are being sold for more than fifty quid. Bloody hell!). Unfortunately, I don't have a bottle of this polish myself. 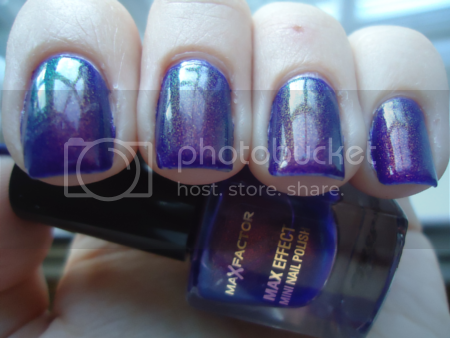 But what I do have is its dupe, Max Factor Fantasy Fire 45. When I first read that Max Factor had created a supposed dupe of Clarins 230, I almost choked on my mouthful of Diet Coke. I then decided that right that very minute I had to find one, so I popped to my local Superdrug. Lo and behold, they had it in stock - so I bought four bottles! It's always good to have backups, right? Loooook! It's a rainbow in a bottle! As with Clarins 230 it's quite sheer and is best used as a layering polish, particularly if you want the bottle to last longer. I tried two different layering combinations. The first was a-england Avalon, a deep and shimmery purple. 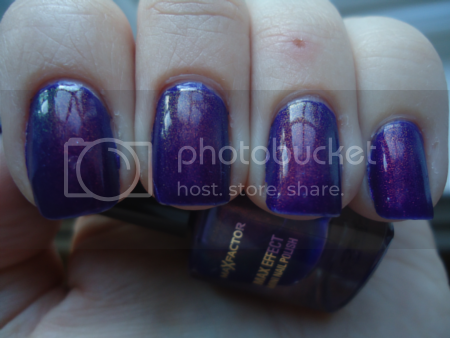 I did two coats of Avalon and two of Fantasy Fire, plus a top coat. I'm actually a little disappointed with this combination. Is that silly? It looks amazing, but I think because Avalon is such a beauty in and of itself, it doesn't give Fantasy Fire a true opportunity to shine. The incredible multichrome shimmer that makes Unicorn Pee and Fantasy Fire so unique gets lost a bit. 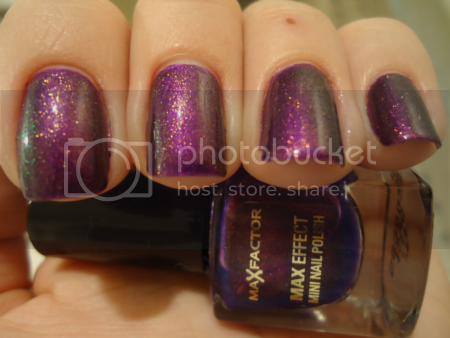 Having said that, look at that insane green shimmer on the left of my index finger in the last picture! 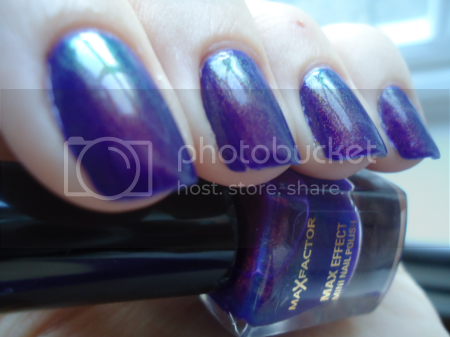 The second layering combination I tried was with Barry M Indigo, which is a blue/purple shade that's also very pretty on its own. 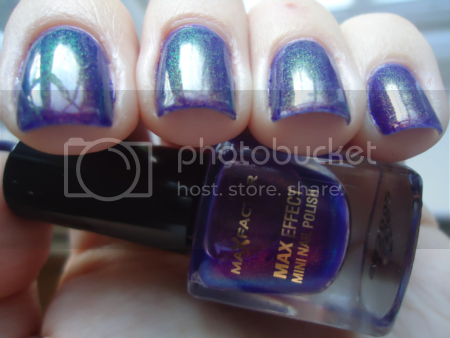 Again, I did two coats of Indigo, two of Fantasy Fire, and a top coat. I forgot to take photos of it initially, so unfortunately there is a little tipwear. I don't think it diminishes the polish at all, though. Isn't it stunning?! I'm so pleased with how this combination turned out. The bluer base of Indigo really gives Fantasy Fire the opportunity to stand out and show its true colours - all five billion of them! As I don't have Clarins 230 so I can't really comment on whether it's a true dupe or not. However, after a quick web search I found a comparison post on another blog, which you can find here. The conclusion seems to be that in the bottle it's a bit different, but on the nail it looks exactly the same (huzzah!). 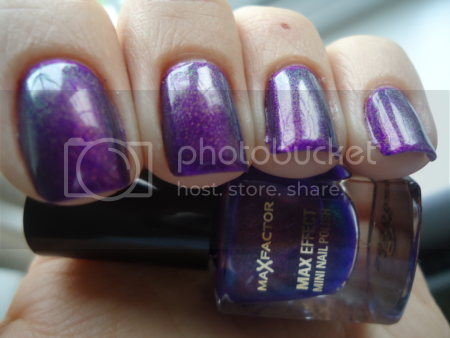 Max Factor Fantasy Fire is being sold for £3.99 for a 4.5ml bottle, which is tiiiiiny. That's almost £12 for the equivalent 15ml full-size. However, given the extortionate prices Clarins 230 is going for on eBay, I think Fantasy Fire is worth every penny!